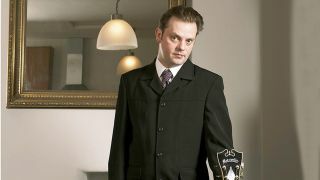 He's one of the UK's top jazz guitarists, but how will he handle the 10 questions we ask everyone? "My first guitar was a steel-string acoustic - it was only a cheap one but it got me started. The first guitar that was really significant was a Tokai S-type. At the time it was a real step up from anything I'd had before. It was natural wood colour and had a whammy bar. I can't remember what became of it, but I wished I'd kept it." 2. If the building were burning down, what one guitar from your collection would you save? solid - for some years. It was made to my specifications based on all the things I loved about the prototype plus other archtop guitars, but all within Jon's unique design and craftsmanship." 3. What's your oldest guitar that you own? "I have a Yamaha AE1200, which was my first jazz guitar. It's been modified a little but still has the original pickups, tailpiece, and soon. I could never get rid of it as it's a very good instrument. I actually played it on some gigs with my partner Christine Tobin recently, because I'm currently spreading my time between NYC and London, so I've left different instruments in both places so that I can travel light." "I currently use D'Andrea Pro Plec 1.5mm, standard-shaped ones. They're nice to play and have a warm sound. I have to order them online because they're not easily available in shops, although a lot of jazz guitarists use them." 5. When was the last time you practised and what did you play? "I practised yesterday and intend to do some today. I've always been one of those musicians who needs to practise regularly just to keep everything in check, so that's essentially what I was doing, plus I'm trying to learn some new standard tunes. I have met the occasional person who doesn't need to practise much so long as they are playing regularly, but I'm not one of those." 6. When was the last time you changed your own strings? "I always change my own strings, but I love the idea of someone doing it for me. It varies how often, depending on how much I'm gigging. I tend to just change them when the tone has really started to go. Sometimes, stage lighting can be very hot, so I'll get through strings quicker if I'm in those situations a lot." 7. If you could change one thing about a recording you've been on, what would it be and why? "I rarely listen to my recordings because, at the time albums are made, the production process involves hearing takes many times, so that by the time it's done I want to move on. I think all musicians occasionally hear things they've played and feel that perhaps they could play things differently or better now. At the same time, I've learned to live with this because recordings capture a tiny moment of how you're thinking at a certain time. So sometimes, if you hear it years later, you no longer have the urge to change things, but instead enjoy the era it captures." 8. What are you doing five minutes before you go on stage and five minutes after? "Five minutes before, I try to do a warm-up exercise known as the 'spider'. It involves a very gentle stretch of the left hand by moving one finger at a time up the frets while the others stay down. You can make it harder by going closer to the nut or skipping strings. Five minutes after, I will either be packing away, saying hi to people who have come to the gig, or hanging with the band." 9. What aspect of playing guitar would you like to be better at? in 1995, which left my ring finger with very little strength, although it never was great. I got a lot from watching the Tuck Andress tuition video and was practising it a lot, but there is still much room to improve. I've always got by because I use a hybrid pick/ fingers homemade technique that works, and I'm fundamentally a band player rather than solo, but I'd like more independence with the fingers." 10. What guitar advice would you give your younger self? I played for hours, but with very little direction to it. I learned how to concentrate on goals and separate subjects of study later, so if I went back to my younger self I could give some advice about that and possibly have got to things quicker."